What is Gujarati Input Method Editor? An Input Method Editor (IME) is a program that provides a method of being able to input or type in a language. An OS can display a language without a user being able to type in that language. For example, currently on Android 5.0+ (Lollipop), we can read Gujarat text because Google has included the Noto Sans Gujarati font. However, there is no Gujarati keyboard included so we cannot type in Gujarati. Google does provide a Handwriting Input method that supports Gujarati so you can write Gujarati and it will be recognized as Gujarati, but there is no keyboard so you cannot type Gujarati. Sometimes, handwritten input is not recognized so being able to type is preferred. 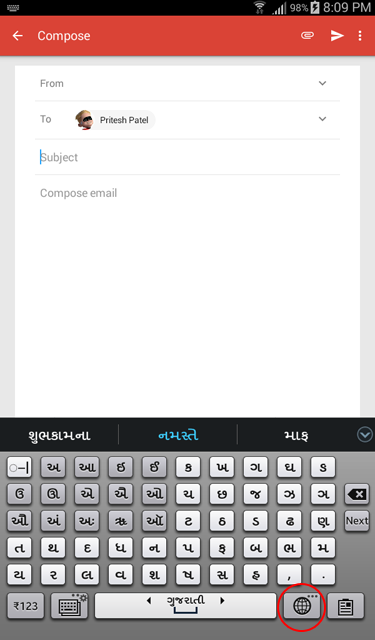 The SwiftKey App provides an kebyoard that supports Gujarati. It's a hefty app to download if you prefer SwiftKey. And since it's an app, it can be used on any phone with Android 5.0 or greater (if your device includes the Gujarati font). 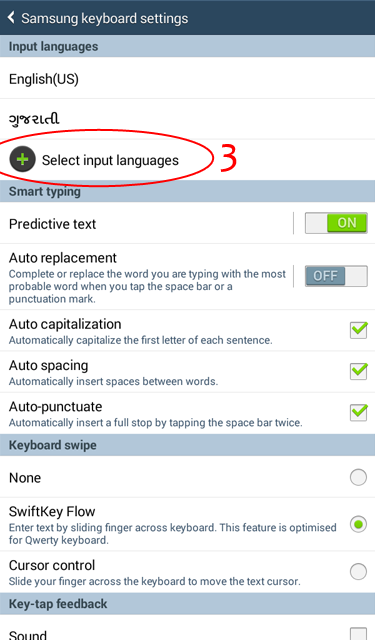 If you have a Samsung Galaxy device, however, you can use Samsung's keyboard to type Gujarati. Just add the Gujarati language as one of the languages from Language settings. 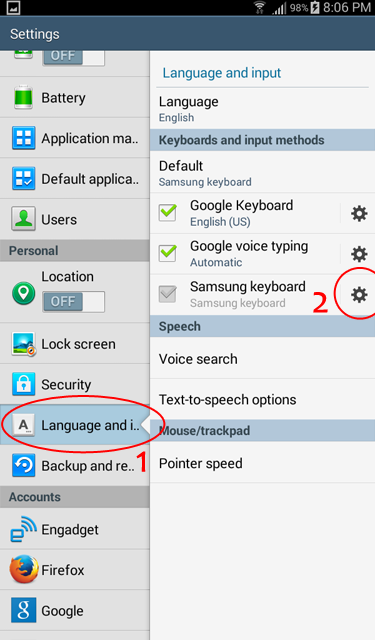 By using Samsung's own keyboard, you can avoid downloading a third-party app for Gujarati input. The Samsung keyboard is visually not that appealing but it's not that bad. 1. Go to settings and select "Language and Input". 2. Then select the "gears" icon associated with the Sasmung keyboard to go to its settings. 3. Select "Select input languages". This menu will allow you to add other languages, including Gujarati and Hindi. I have already added Gujarati so it is showing under "Input languages". 4. 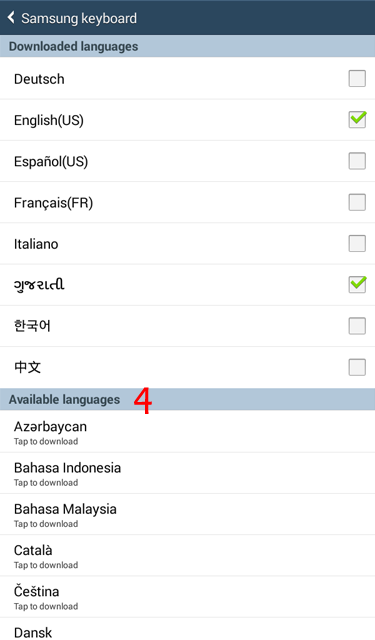 Under the section "Available languages", find Gujarati or any other language that you want to add. The keyboard input method editor will be downloaded for the languages you select. On this same screen, you'll see that Gujarati has already been added under "Downloaded languages". You can see Samsung keyboard below with language changed to Gujarati. You can simply touch the gears icon to change the input between the languages. It's not a bad keyboard, with all the letters in order. I hope someone develops a standard layout though which is found in all other OS's.